My test emails show "Test First Name" or "Test Last Name." We strongly recommend you preview and test your campaigns before you send to your contacts. When you send a test email or preview your campaign, you might notice the merge tags you used have been replaced with unexpected text, such as << Test First Name >> and << Test Last Name >>. In this article, you'll learn why these tags display differently when you're testing, and how you can preview real contact information. 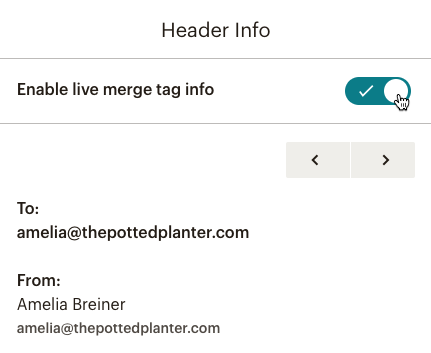 If merge tags are working correctly, you'll see placeholder text when you test your campaign: *|FNAME|* and *|LNAME|* merge tags will display as <> and <>, respectively. When you send the campaign, the placeholders will be replaced with live data from your list. In case you don't have data for a contact in your list, we recommend you set defaults for your merge tags. That way, the default value you set will display for subscribers who don't have any data for that field. To preview real subscriber information in the Campaign Builder, follow these steps. 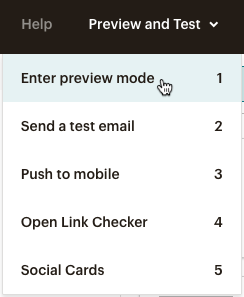 Click the Preview and Test drop-down menu and choose Enter preview mode. Toggle the slider to the green checkmark to Enable live merge tag info. Use the left and right arrows to move through your list's contacts. Learn how to set default merge values for your audience. A default merge value will act as a replacement to fill in for missing field information.